Remember setting up the silverware just so? Remember retrieving the fine serving pieces from the hutch to help your parents set up for a party? The Amish Ancient Mission Side Board offers a lovely storage and service cabinet to help host your own parties now. The Amish Ancient Mission Side Board is shown here in brown maple wood with antiquated Michael's stain and offers three top cabinets, two lower drawers, a lower shelf and a gorgeous thick top for serving. 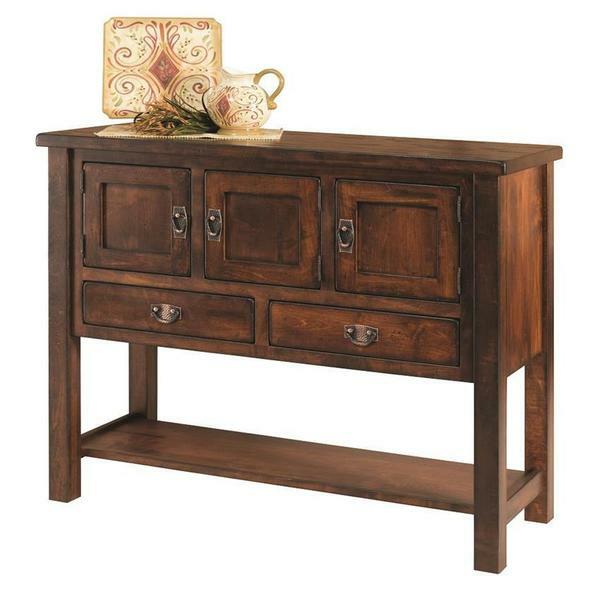 The Amish Ancient Mission Sideboard fits right in with dining room, hallway, living room or foyer decor. Style yours today with wood options right at your fingertips. We have Furniture Specialists here who can answer any questions. Email or call us today to start your experience with DutchCrafters. Thanks for shopping with us.